First introduced by world-renowned strategic thinker Roger Martin in The Opposable Mind, integrative thinking is an approach to problem solving that uses opposing ideas as the basis for innovation. 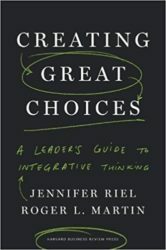 Now, in Creating Great Choices, Martin and his longtime thinking partner Jennifer Riel vividly illustrate how integrative thinking works, and how to do it. The book includes fresh stories of successful integrative thinkers that will demystify the process of creative problem solving, as well as practical tools and exercises to help readers engage with the ideas. And it lays out the authors' four-step methodology for creating great choices, which can be applied in virtually any context. The result is a replicable, thoughtful approach to finding a "third and better way" to make important choices in the face of unacceptable trade‐offs. Insightful and instructive, Creating Great Choices blends storytelling, theory, and hands-on advice to help any leader or manager facing a tough choice. They say we stay inside of our own social media bubbles, never truly pushing ourselves to explore what is outside of our comfort zone. This book is a thoughtful, quiet instruction manual on how to break out of your own bubble of repeated thoughts and learn new models of thinking. While a bit academic, Riel has a patient voice and guides readers on what mental models are. This isn’t a book to be read once and then gather dust on the shelf. Rather, if you are truly putting this book to its intended use, you’ll pick it up over and over again to push your boundaries and find ways to grow. Riel includes plenty of “Try This” thought experiment instructions and helpful illustrations for you to put the book to work in your own life.